Storey Publishing, LLC, 9781612124445, 96pp. Mulch your way to a vibrant and healthy home landscape. 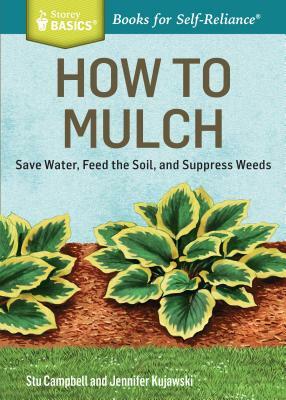 Profiling a variety of techniques that include sheet mulches, feeding mulches, and living mulches, Stu Campbell and Jennifer Kujawski help you choose the best mulching strategy for your backyard, vegetable garden, or flower bed. You’ll be amazed at how properly mulching can both beautify your outdoor space and ease your gardening life by retaining moisture, keeping weeds in check, protecting young plants, and boosting production. Jennifer Kujawski grew up helping in the family garden. She has many memories of the experience, both fond (eating peas straight from the pods) and not-so-fond (squashing potato beetles between rocks). Jennifer earned degrees in botany and horticulture and worked as the assistant manager of USDA’s National Plant Materials Center in Beltsville, Maryland. She has written articles for numerous publications, including American Nurseryman and Native Plants Journal and was one of the authors of the Community Forest Buffer Guide (Chesapeake Bay Foundation, 2001). Jennifer currently works as a freelance writer and editor for such organizations as University of Massachusetts Extension, USDA’s Forest Service, and Massachusetts Nursery and Landscape Association. She is passing along the family gardening tradition to her young son in the 2,000 square foot vegetable garden she tends with her father.